What are the Benefits of PMP for Businesses? Earning a ‘Project Management Professional (PMP)’ certification can be a huge stepping stone for an ambitious manager. One of the world’s most highly respected project management certifications, PMP can help a candidate to unlock higher salaries and upper-level management positions, as well as opportunities in various industries and locations. This is largely due to the startling prerequisites for achieving a PMP certification. Not only does a candidate need thousands of hours worth of project management experience, but they also require at least 35 contact hours of project management education. Managing to satisfy these standards and complete the rigorous PMP examination is a huge validation of a manager’s abilities; so much so that many organizations specifically request that candidates for certain roles have PMP certifications. However, while reaching this level is definitely worth aspiring to for individuals, the qualification can also offer a great deal of value to businesses. There is a lot to say for having this kind of talent on staff! Even so, becoming PMP certified requires a great deal of investment. Candidates and companies must consider not only the undertaking of accredited PMP training (along with the examination) but also the thousands of hours that need to be spent building up project management experience. It is not uncommon for organizations to fund PMP training, but how should a candidate go about convincing their employer to agree to it? Naturally, if you want to be successful, you will need to be able to make a convincing case for the benefits of PMP certifications for businesses. To help you out, we’ve made a list of the most important advantages you’ll need to keep in mind! Project management is a skill that is relevant to all businesses and organizations, regardless of their location, sector or industry. But what is project management, in a nutshell? They must also be capable of employing these skills within given constraints, making sure not to waste resources, go behind schedule, and so on. This will often require managers to use a standardized framework or methodology, but even so, they must still be flexible enough to accommodate unique challenges and unforeseen changes. Luckily, PMP makes it easier to identify candidates of this caliber. In order to pass the PMP exam, a candidate must be familiar with the project management guidelines covered in the Project Management Body of Knowledge (also known as the PMBOK Guide). This highly comprehensive guide is updated every four years to ensure that it covers the ever-evolving world of project management. A candidate must have also spent thousands of hours managing projects, solidifying their understanding of best practices with real-world experience. By helping a manager to become PMP certified, an organization can turn them into a far more knowledgeable and valuable asset. Better still, if they are already familiar with the workings of the organization, they will be able to start making positive changes much more quickly. PMP certifications are recognized globally, with demand for qualified candidates being prevalent on every continent and in virtually every industry. This level of recognition can be valuable for businesses, helping them build up their presence and reputation. Potential partners will see a PMP certification as a sign that a business can be trusted to reliably deliver top-quality results with a well-practiced and highly respected methodology. This may sound presumptuous, but keep in mind just how difficult it can be for candidates to become PMP certified. Even experienced managers are often surprised by what they don’t know after first studying the PMBOK Guide. Anyone who knows about PMP knows how comprehensive the requirements are, and knowing that a company follows the PMBOK Guide to a tee can earn it plenty of brownie points. Partner organizations which are both employing PMP qualified staff can take this advantage a step further. Not only will they have greater confidence in each other’s capabilities, but they will also be familiar with the same language and methodologies, which can provide a huge boost to the effectiveness of communication and collaboration. If an organization really wants to improve its project management capabilities, it will need to spend time improving its workplace culture. Once best practices are integrated into an everyday business environment, staff will become much more comfortable working in accordance with them. This can save a great deal of time when it comes to deploying said practices, and staff will also be able to enjoy ample opportunities to gain valuable skills and experience. A PMP qualified project manager is an ideal candidate for creating such an environment. They will ensure that strategies and practices remain aligned with the needs of the organization, while also fostering communication and engagement from employees with different backgrounds. They can even work on less tangible factors, such as encouraging the correct workplace ethics. Most importantly, they can continually audit project management processes in order to make sure that the correct standards are being followed. Finally, creating this kind of environment can help businesses to attract the talent they require. It is not uncommon for managers with PMP credentials to help screen candidates in order to resolve any skills shortages in their teams. Should other employees choose to pursue PMP certifications, having a mentor on hand will also go a long way in enabling their progress. A successful manager must be able to adapt to changing project requirements and marketplace environments. External factors such as competitor activity or customer expectations can have a huge impact on ongoing projects, and simply ignoring impetus for change can result in delays for a project team. In many cases, this requires that managers be equipped to take an incremental approach, using iterative tools and techniques while also making regular project reassessments. While this will add tasks to a project, it can also allow an organization to enjoy benefits sooner rather than later, and will also provide plenty of opportunities for a manager to make any necessary changes. The PMI realizes the importance of adaptability and has thus made it a part of both the PMBOK Guide and the PMP exam itself. Remember, project management is always evolving, and it takes a creative and well-practiced manager to be able to take advantage of opportunities when they present themselves. One of the biggest strengths of the PMBOK Guide is that its knowledge can be applied to organizations in virtually any industry or location. Whatever your business does or what constraints you are working under, a PMP certified manager can help you achieve your goals. It is also worth pointing out that this will remain true even as a business scales up or enters new markets. In fact, a PMP certified pro can make the transition easier, helping a company to accommodate unfamiliar markets, new technology or even simply projects which have more resources to play with. Why Purchase a PMP Course from Good e-Learning? When it comes to clocking in the 35 contact hours required for the PMP certification exam, it is worth investing in quality. There are many PMP training providers which profess to be able to offer easy paths to the certification, but this is usually just hot air. Without a clear understanding of the PMBOK Guide’s best practices, you will not be capable of passing the comprehensive 200-question PMP exam. 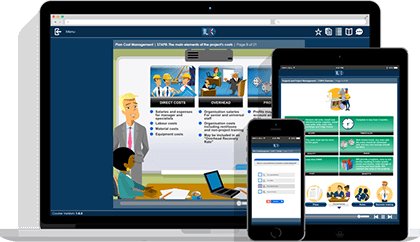 Our Project Management Professional (PMP)® e-course comes from the ILX Group. It offers an engaging and comprehensive introduction to PMP, complete with audio-narratives, graphical sources and practice exams to help students cement their knowledge. Users can even enjoy 24/7 support from our in-house team of experts. Good e-Learning offers an award-winning portfolio covering many of the world’s most popular corporate standards and frameworks. We believe in making top-quality training as accessible as possible. Because of this, each of our courses is easily accessible even on mobile devices and tablets, and with months to study, students find it easy to fit training around full-time work.